This past Christmas, Robin Santa brought me an Eno Double Nest Hammock and a pair of ENO Slap Straps to hang it. I was so stoked to have received such a wonderful gift, but at the same time bummed because it was winter and had no idea when we would get to try this thing out. Shortly after Christmas, it was rounded up with other Christmas toys and gifts and placed in an area in our computer room/ham shack/office/hamster portrait studio/library/etcetera etcetera where it was - for lack of a better word - forgotten. When we decided on taking our very impromptu and last minute camping trip to Norris, Robin remembered the hammock and took it with us. Alas, the trip was such a quick getaway, we never really found the time to use it. So again it was tucked back in the multifunctional room with the rest of our outdoor gear only to wait patiently another few weeks before finally getting loose of it's container and put to use. In the spring we finally busted it out and tried outside at home. We've used it a few times since then too, mostly at home and recently when we hiked the Kephart Prong Trail in the Great Smoky Mountains National Park. It was very nice to have the hammock on the trail. When we reached our halfway point (which also happened to be lunch time), we strung up the hammock next to Kephart Prong, and - although it is built for two and fits both of us quite comfortably - took turns relaxing in the wilderness because Robin wouldn't share with a "stinky man". Comes in various colors and color combinations. 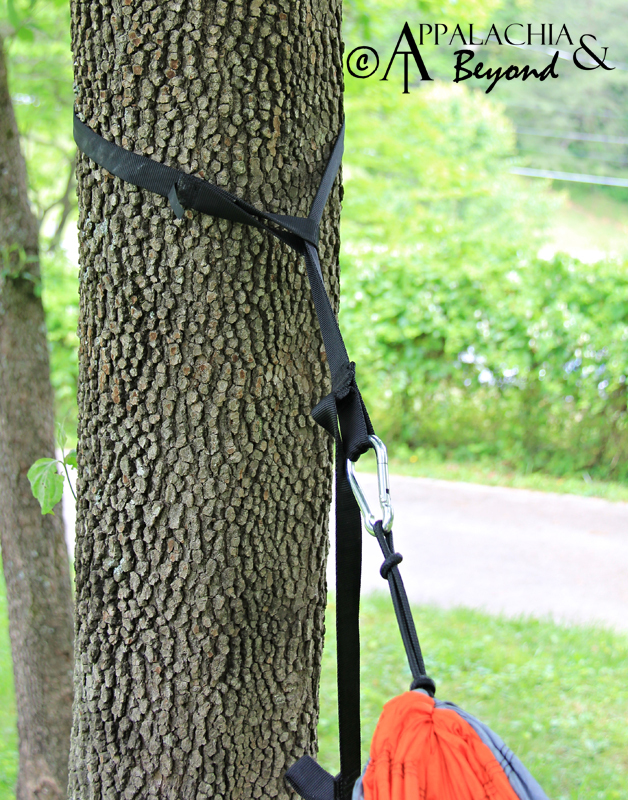 Maximum Support Weight: Each strap supports up to 200lbs. 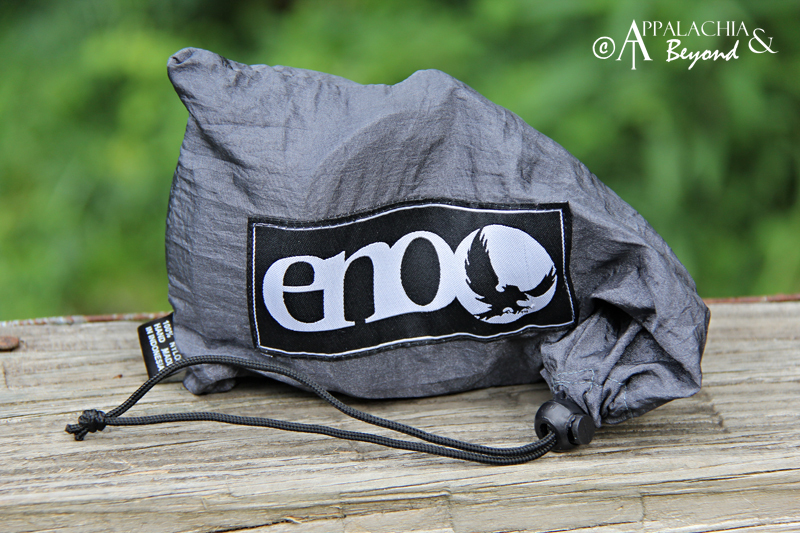 - The ENO Double Nest is a breeze to put up. Complete with the Slap Straps, it takes no time to get the hammock hung and ready for relaxing between two trees. 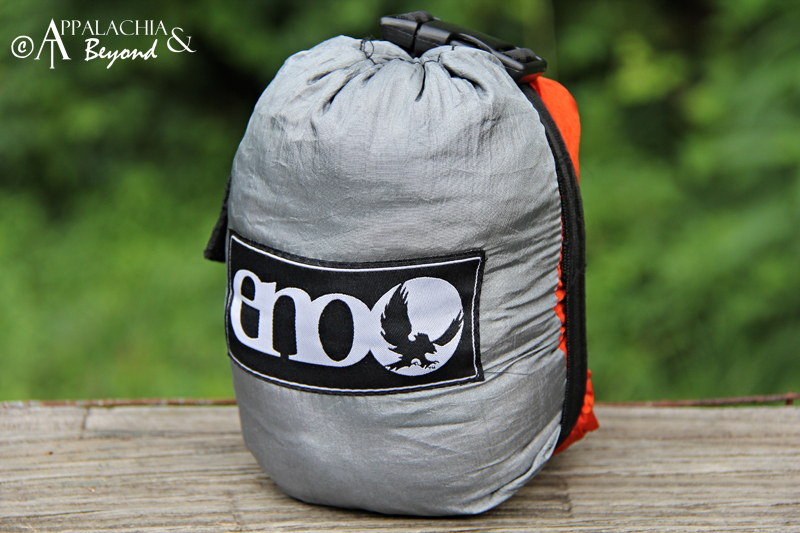 - The ENO Double Nest stores quite nicely in its own attached stuff sack. It compresses quite nicely, too. So it's easy to pack in your daypack or overnight pack. The slapstraps have their own bag, and they are easily stowed away in your pack as well. - In the late spring, all of summer, and early fall, the material allows the cool breeze to hit you square in the back for a much needed cooling after a long hike up a mountain, etc. 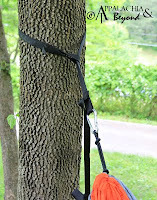 - The Double Nest is very roomy and comfy for two people, and with the slap straps can easily support up to 400 lbs. of weight (200 lbs each). 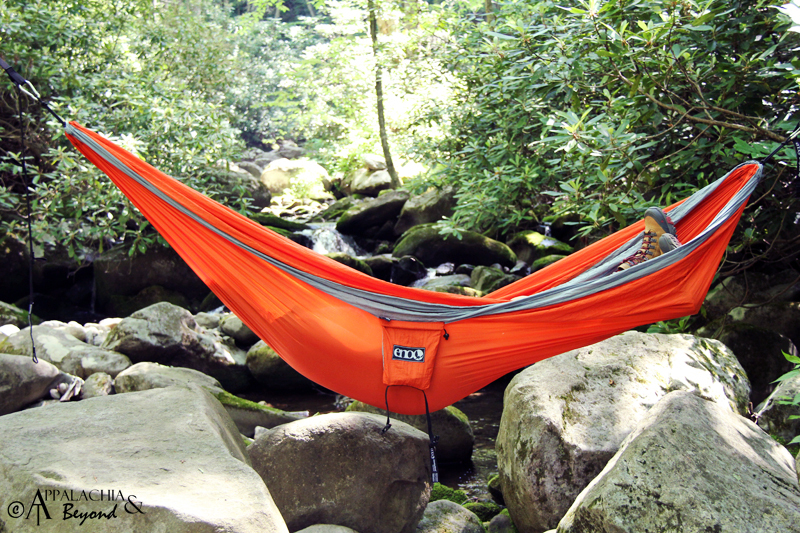 - With the ENO Slap Straps , you can hang your hammock just about anywhere. - While the Double Nest and slapstraps pack well in your pack, they are a bit on the heavy side. On long treks, this might not be the best choice of gear to have along with you. However for a day trip, if you don't mind the extra weight, it will certainly come as a welcomed retreat to relax out on the trail. - In the late fall, all of winter, and early spring, pretty much anytime it is cold, the material of the hammock easily allows the drafts to come up and chill you pretty good. 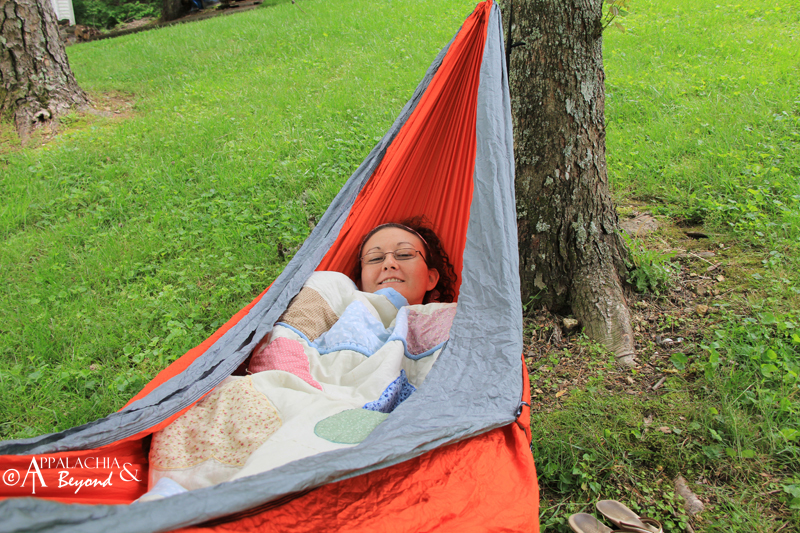 One simple fix for this is to lay a blanket or a sleeping bag in the hammock and lay on top or inside it. That should keep the cold off your back. 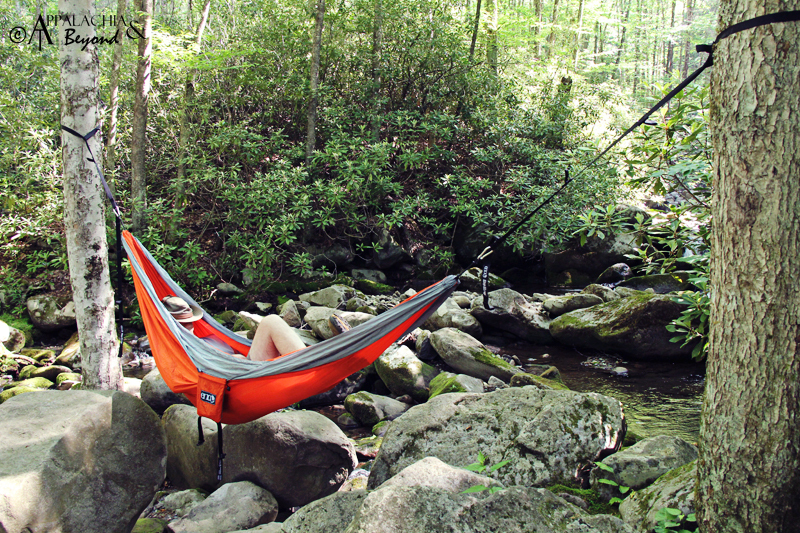 All in all, we absolutely love our ENO Double Nest Hammock and look forward to many years of constant use. Furthermore I really look forward to having it on our camping trips so I don't always have to resort to chairs or the air mattress inside the tent when I want to relax and nap.